One of the things that's most fun about my job is the chance to create something all new and completely unique. That can happen in a lot of ways - blending an unexpected mix of colors or patterns, solving a problem with space planning, playing with scale - but the most obvious way it happens is designing something that's not already out there on the market to meet a specific need for a space. In other words, creating a custom piece of furniture. It's not something that happens every day for a designer, but I haven't been doing this all that long (two years), and I've already had the chance to see one piece through from conception to completion (pictured) and am about to start conceptualizing another one. Which is why the topic's on my mind. In both instances, the reason the client and I pursued a custom piece was because we searched and searched and searched for an existing piece that met their needs - space-wise, function-wise, style-wise - and came up short. With the gazillions of home products out there for sale, you'd think that'd be an uncommon problem, but it happens all the time. The biggest surprise - for me and my clients - is that a custom-designed, custom-made piece of furniture isn't necessarily as unattainable, price-wise, as you might think. 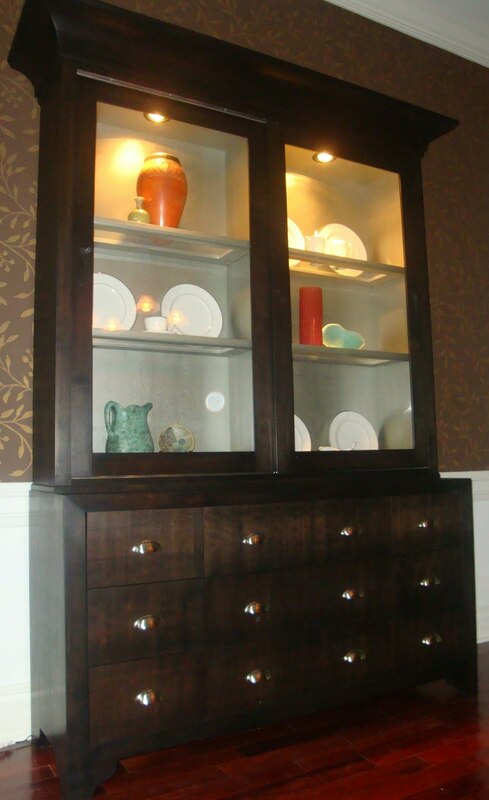 The china cabinet pictured above is the perfect height and width for the space, has the exact finish the client wanted (plus a metallic finish inside that literally makes it shine), and has shelves and drawers configured specifically for the items the client wanted it to hold. It doesn't get any better than that. And the price tag wasn't much higher - maybe 15-20% - than a comparable piece from a decent furniture manufacturer. Worth it, because the piece is not only ideal for the space, but it's handcrafted from solid wood and made in our local community (a real anomaly these days, since nearly all furniture is made overseas). It's also well-built - something the family will hold onto and pass down for generations. Now I'm about to pick up my drawing tools (yes, I draw by hand, also an anomaly these days but so much more fulfilling for me) and get to work sketching out ideas for my new piece.. This cabinet, by the way, was built by Brian Chambers of Premiere Woodworks, which is based in Collierville. Brian is fabulously talented and a GREAT guy to work with.